I can’t beleve how fast this project has come along. It was only early last year when Sam Remi’s Spider-Man 4 got cancelled and Marc Webs got the sign off. 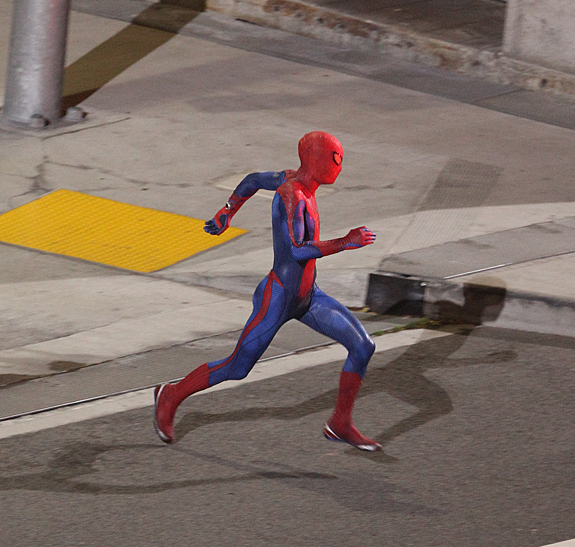 Here we have another picture of Spider-Man on set in the full costume thanks to splashpage. The costume itself looks a little rough an could be used just for stunt doubles. Another reason could be that the final costume will have a little CGI for finishing touches. Either way it just complements the Close-up Spider-Man costume we saw last week which just left Spider-Man fans world wide breathless in ore with its freaking awesomeness. Dark Knight step aside this could be the comic book movie franchise we remember the decade for.